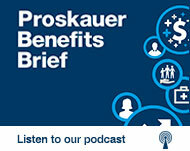 Seth J. Safra is a partner in Proskauer’s Employee Benefits & Executive Compensation Group. Described by clients as “extremely knowledgeable, practical, and strategic,” Seth advises clients on compensation and benefit programs. Seth’s experience covers a broad range of retirement plan designs, from traditional defined benefit to cash balance and floor-offset arrangements, ESOPs and 401(k) plans—often coordinating qualified and non-qualified arrangements. Seth also advises on ERISA compliance for investments, including the U.S. Department of Labor’s new conflict of interest (fiduciary) rules. On the health and welfare side, Seth helps employers provide benefits that are cost-effective and competitive. He advises on health plans with HSAs and HRAs and also on severance and fringe benefit arrangements.